Wi-Fi and cellular data traffic are increasing exponentially but, unless the capacity of wireless links can be increased, all that traffic is bound to lead to unacceptable bottlenecks. Upcoming 5G networks are a temporary fix but not a long-term solution. For that, researchers have focused on terahertz frequencies, the submillimeter wavelengths of the electromagnetic spectrum. Data traveling at terahertz frequencies could move hundreds of times faster than today's wireless. 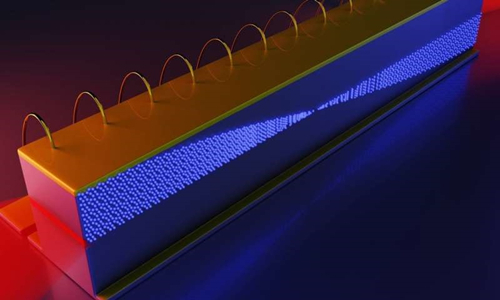 In 2017, researchers at the Harvard John A. Paulson School of Engineering and Applied Sciences (SEAS) discovered that an infrared frequency comb in a quantum cascade laser could offer a new way to generate terahertz frequencies. Now, those researchers have uncovered a new phenomenon of quantum cascade laser frequency combs, which would allow these devices to act as integrated transmitters or receivers that can efficiently encode information. The research is published in Optica. "This work represents a complete paradigm shift for the way a laser can be operated," said Federico Capasso, the Robert L. Wallace Professor of Applied Physics and Vinton Hayes Senior Research Fellow in Electrical Engineering and senior author of the paper. "This new phenomenon transforms a laser―a device operating at optical frequencies―into an advanced modulator at microwave frequencies, which has a technological significance for efficient use of bandwidth in communication systems." Frequency combs are widely-used, high-precision tools for measuring and detecting different frequencies―a.k.a. colors―of light. Unlike conventional lasers, which emit a single frequency, these lasers emit multiple frequencies simultaneously, evenly spaced to resemble the teeth of a comb. Today, optical frequency combs are used for everything from measuring the fingerprints of specific molecules to detecting distant exoplanets. This research, however, wasn't interested in the optical output of the laser. "We were interested in what was going on inside the laser, in the laser's electron skeleton," said Marco Piccardo, a postdoctoral fellow at SEAS and first author of the paper. "We showed, for the first time, a laser at optical wavelengths operates as a microwave device." Inside the laser, the different frequencies of light beat together to generate microwave radiation. The researchers discovered that light inside the cavity of the laser causes electrons to oscillate at microwave frequencies―which are within the communications spectrum. These oscillations can be externally modulated to encode information onto a carrier signal. "This functionality has never been demonstrated in a laser before," said Piccardo. "We have shown that the laser can act as a so-called quadrature modulator, allowing two different pieces of information to be sent simultaneously through a single frequency channel and successively be retrieved at the other end of a communication link." "Currently, terahertz sources have serious limitations due to limited bandwidth," said Capasso. "This discovery opens up an entirely new aspect of frequency combs and could lead, in the near future, to a terahertz source for wireless communications."